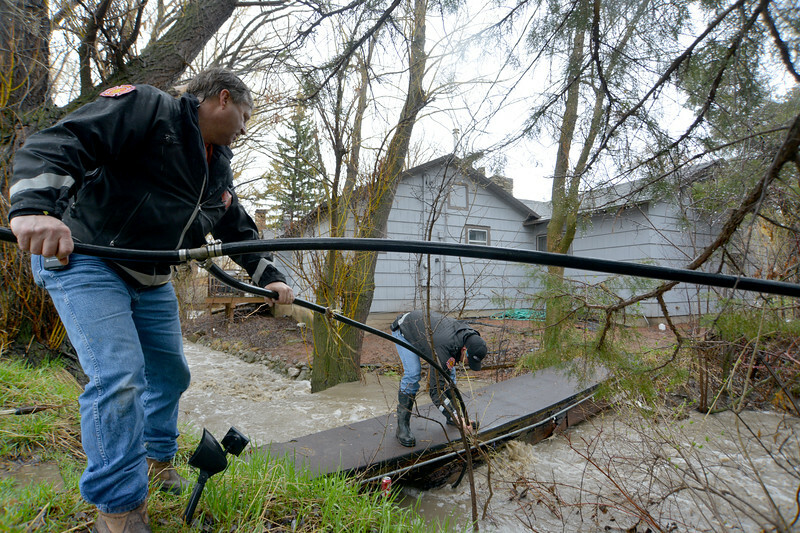 James Allison crosses High Street as water from the Jackson Creek spills over Friday afternoon in the town of Big Horn. Resident reported the flooding around 11 a.m. Friday morning after the water from the Jackson Creek began to flow over a culvert running under the intersection of 1st and High Streets near Big Horn School. Residents responded by filling sandbags to keep water from spilling into nearby homes. Big Horn Volunteer Fire Department responded by providing sandbags and clearing debris from culverts and drains. The National Weather Service has issued a flood advisory for parts of Sheridan County, which states that heavy rain and snow melt could lead to flooding along creeks and streams. 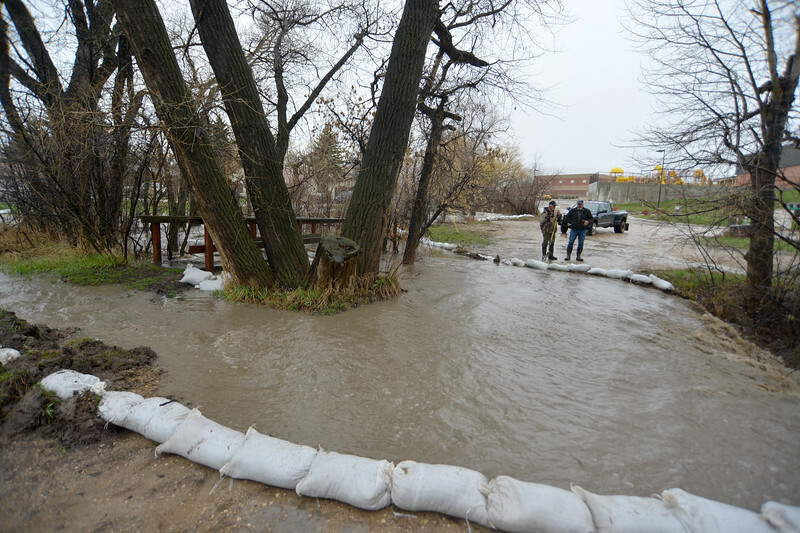 Sandbags hold the overflow by the Jackson Creek Friday afternoon in the town of Big Horn. Resident reported the flooding around 11 a.m. Friday morning after the water from the Jackson Creek began to flow over a culvert running under the intersection of 1st and High Streets near Big Horn School. Residents responded by filling sandbags to keep water from spilling into nearby homes. Big Horn Volunteer Fire Department responded by providing sandbags and clearing debris from culverts and drains. The National Weather Service has issued a flood advisory for parts of Sheridan County, which states that heavy rain and snow melt could lead to flooding along creeks and streams. 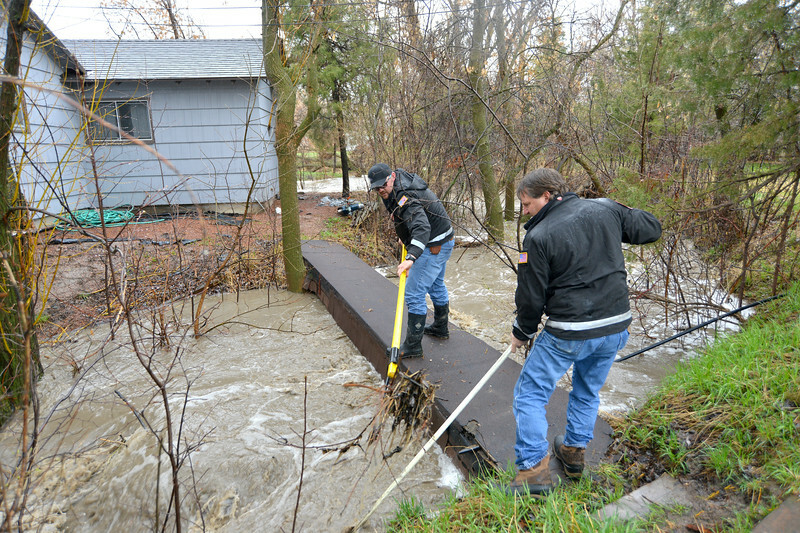 Big Horn Volunteer Fire Department firefighters Joel Wardell, left, and Chief Doug Enloe remove debris caught under a resident’s footbridge over the Jackson Creek Friday afternoon in the town of Big Horn. 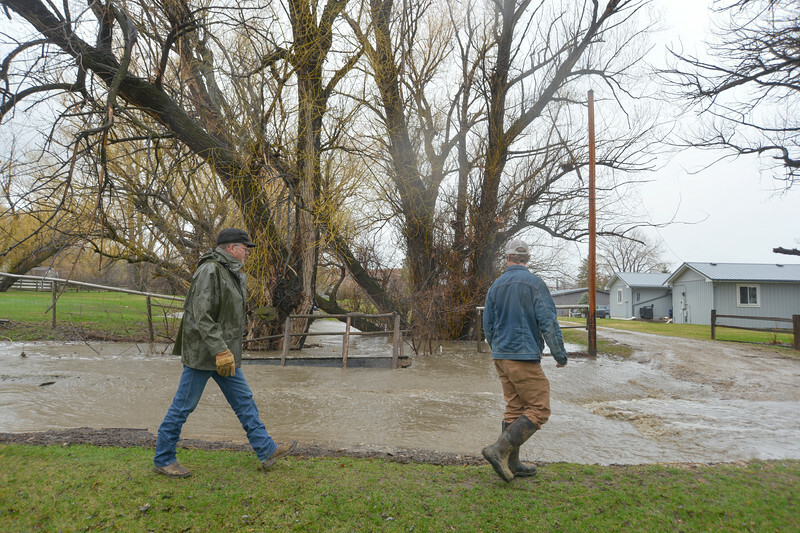 Resident reported the flooding around 11 a.m. Friday morning after the water from the Jackson Creek began to flow over a culvert running under the intersection of 1st and High Streets near Big Horn School. Residents responded by filling sandbags to keep water from spilling into nearby homes. Big Horn Volunteer Fire Department responded by providing sandbags and clearing debris from culverts and drains. The National Weather Service has issued a flood advisory for parts of Sheridan County, which states that heavy rain and snow melt could lead to flooding along creeks and streams. Big Horn Volunteer Fire Department firefighters Joel Wardell, back, and Chief Doug Enloe remove a water hose caught under a resident’s footbridge over the Jackson Creek Friday afternoon in the town of Big Horn. Resident reported the flooding around 11 a.m. Friday morning after the water from the Jackson Creek began to flow over a culvert running under the intersection of 1st and High Streets near Big Horn School. Residents responded by filling sandbags to keep water from spilling into nearby homes. Big Horn Volunteer Fire Department responded by providing sandbags and clearing debris from culverts and drains. The National Weather Service has issued a flood advisory for parts of Sheridan County, which states that heavy rain and snow melt could lead to flooding along creeks and streams. 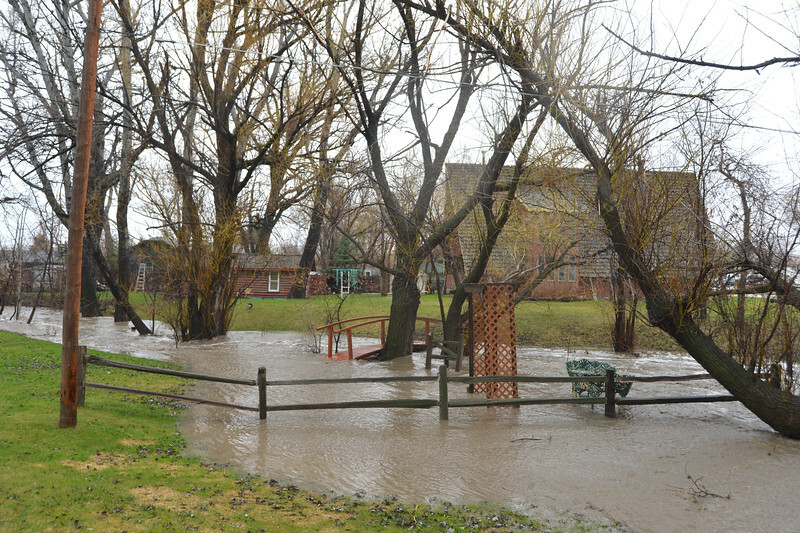 The Jackson Creek floods a resident’s yard in the town of Big Horn Friday afternoon. Resident reported the flooding around 11 a.m. Friday morning after the water from the Jackson Creek began to flow over a culvert running under the intersection of 1st and High Streets near Big Horn School. Residents responded by filling sandbags to keep water from spilling into nearby homes. 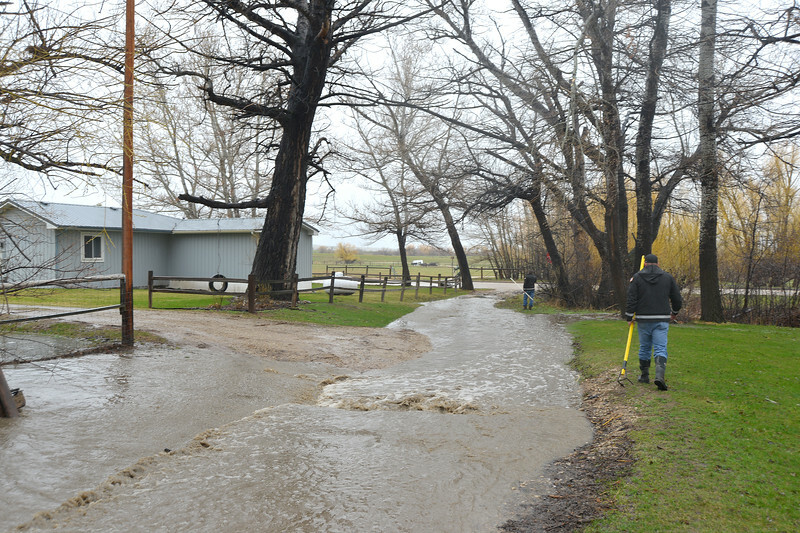 Big Horn Volunteer Fire Department responded by providing sandbags and clearing debris from culverts and drains. The National Weather Service has issued a flood advisory for parts of Sheridan County, which states that heavy rain and snow melt could lead to flooding along creeks and streams. Big Horn Volunteer Fire Department firefighters walk along a street flooded by the Jackson Creek Friday afternoon in the town of Big Horn. Resident reported the flooding around 11 a.m. Friday morning after the water from the Jackson Creek began to flow over a culvert running under the intersection of 1st and High Streets near Big Horn School. Residents responded by filling sandbags to keep water from spilling into nearby homes. 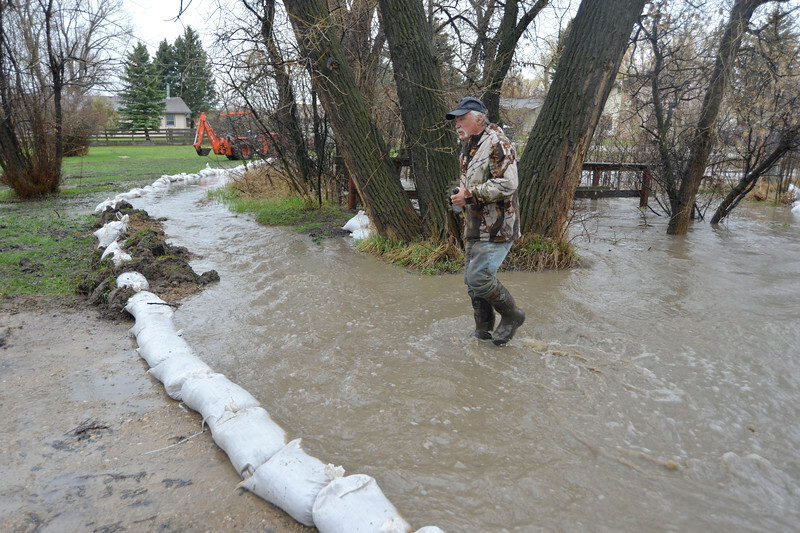 Big Horn Volunteer Fire Department responded by providing sandbags and clearing debris from culverts and drains. The National Weather Service has issued a flood advisory for parts of Sheridan County, which states that heavy rain and snow melt could lead to flooding along creeks and streams.